On the evening of May 4, 1970, at the University of California at Berkeley, I became the director of the Peace Information Center. 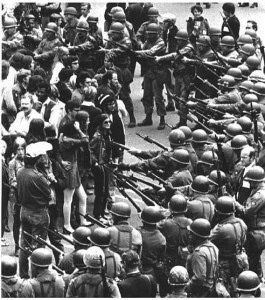 Earlier that day poorly trained, poorly commanded National Guardsmen had fired randomly into a Kent State University crowd protesting the official expansion of the Vietnam War into Cambodia. The guardsmen fired for 13 solid seconds, killing four and wounding 13. At Berkeley you’d try to get to class, but students would hold sit-downs, blocking hallways, piling themselves into doorways so you had to step over them to enter classrooms. That evening I happened to find myself at an emergency student meeting when my friend Gail Hart swept in and sat down brusquely next to me. “Like, they shout at you, ‘Four students were killed today and you want to go to class!’ It’s suuuch a guilt trip,” she said, taking a cardboard basket of food out of a white paper bag. I remember mumbling something about how I worked at the library and could get us at least one of those huge library tables, and how there were so many peace groups around that didn’t know what each other was doing, and how maybe we could bring all our stuff to one place and get coordinated. Suddenly, I was director of “The Peace Information Center.” I still have the sign they made for me to sit behind two days later when it opened. 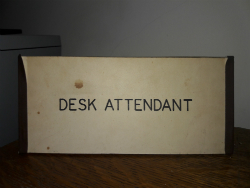 It read: “Desk Attendant.” But at that exact moment in the meeting, I was mainly still hungry. I’m Filipino and supposedly know everything about fish, but I had never seen anything like what Gail Hart was eating. 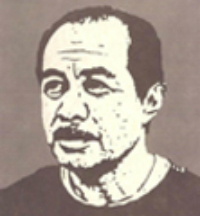 “See here, Guzman,” he began. “We have information that you and some of your friends are planning to bomb the library.” I blacked out, though I don’t think I fell over. When I came to seconds later, I remember thinking how far I’d kept myself from Berkeley’s famous radical movements, movements that had struck and closed the university four times during my undergraduate career, had made National Guardsmen and helicopters and caustic teargas a regular part of my curriculum, had pissed off then-governor Ronald Regan so much that he had flipped a bunch of us off as he disembarked a helicopter that had whisked him to campus to survey the disobedience. When hoards of students demonstrated against the university’s attempt to evict hippie squatters from one of its empty lots, I had refused to take part in the so-called People’s Park Protest, even though the popping P’s sounded good to my English-major ear. True, I had played a part in the Third World Strike that had shut down the campus for days and resulted in the establishing of the country’s first ethnic studies college; but I had played a peaceful part, and to this day I have no idea how the leaders of that protest found me. And, honestly, I had wandered into that Black Panther Party meeting by mistake and been called a fool for standing next to a window just inviting white snipers, supposedly scoping us from adjacent high risers, to pick us off. “Get down, fool!” someone hissed, shoving me to my knees. “Oh,” I whispered, crawling backwards quietly towards the door. “This isn’t a meeting for the ethnic studies college?” Outside again, but still on my knees, I eased back up, hearing scraping on the inside as they jammed a large chest of drawers back against the door. I was tainted all right, but it wasn’t my fault. It was Gail Hart’s fault. Especially this time. But as I protested my innocence to the library director and heard him sneer, “Either tell us where the bombs are or…,” I knew I could never ever blame her. The “or,” by the way, was that I’d have to go on bomb patrol with the police, whereupon, as I continued to flubber my innocence, the double doors behind me opened to reveal a couple of policemen with a bomb sniffing dog. I could never blame Gail because, to tell the truth, I’d always had a crush on her. She was tall and thin, but voluptuous. Small waist, luscious breasts, long, dark brown, wavy hair framing a beautifully white face—lightly freckled, but perfectly so. In my mind’s eye, I saw that face when I did go on one round of bomb patrols with the dog and his police handlers. And, actually, a bomb did go off, but it was just a smoke bomb someone had carefully placed in a metal trash can so as not to set off anything but the smoke alarm. Long John Silver’s opened its first store in 1969, presumably in Louisville, Kentucky, where its corporate headquarters still are. 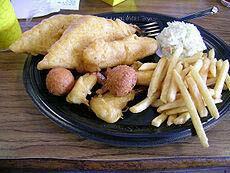 It’s America’s largest quick-service seafood chain, serving more than 45 million pounds of fish yearly. I broke a molar at the Long John Silver’s near the intersection of New York St. and Route 59 on the border between Naperville and Aurora, Illinois. I was chomping on a french fry (or “chip”). It was totally the tooth’s fault. The chip was as scrumptious and as perfect as the deep-fried fish fillets. Until 2015 Long John Silver’s maintained an unflagging commitment to using partially hydrogenated oils in its fryers, so if you ordered the Fish Combo Basket, besides 1930 milligrams of salt, you got 42 grams of fat, 10.5 of them saturated, 12 of them trans-fatted. The move from hush puppies to anti-war radical was sudden. We had blundered into war, and in many ways, in many places—big and very, very small—were beginning to blunder out of it. 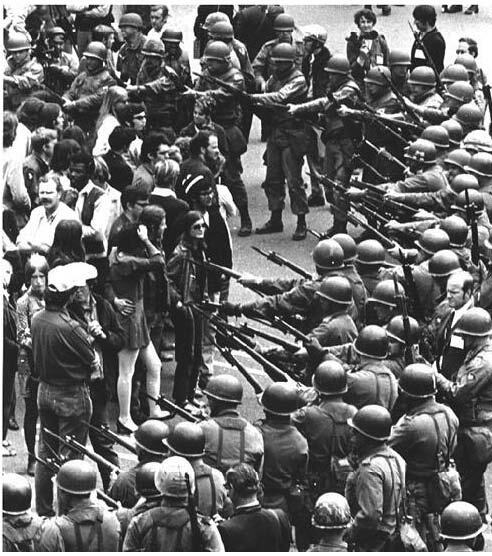 This entry was posted in Social Change and tagged anti-war radicalism, Berkeley anti-war protests, Black Panthers, Cambodia, Kent State killings, Long John Silver's, Peoples' Park protest, Richard R. Guzman, Social Change, Vietnam War. Bookmark the permalink.